It was a strange new episode. For about five hours Tuesday night and Wednesday morning the Northwest had more electricity than it could handle, a lot more. Water was gushing down the Columbia and Snake from the deepest snowpack in 15 years. Dams were necessarily making power at a furious pace while most of us were sleeping, snug in our lukewarm homes using no electricity at all. Overwhelmed, the Bonneville Power Administration ordered every fossil-fuel-burning power plant in the Northwest to shut down. The sole nuclear plant was off line for maintenance. It was not enough. From midnight to 5 a.m. it ordered 10 percent of the region's windmills shut off, about 350 megawatts. It was necessary, said BPA, to maintain reliability, avoid harm to endangered salmon and not force costs onto ratepayers. It was "unavoidable," said BPA Administrator Steve Wright. With that, all should agree. To keep windmills turning more water must be spilled over dams and not turned into electricity. But, too much runoff spilled saturates the river with dissolved nitrogen, harming the juvenile salmon in which the region has an immense investment, their protection required by law and court order. When water goes through turbines it makes electricity, and it must go somewhere. Fish were spared, not a molecule of greenhouse gas added to the atmosphere, but the windmill operators deemed it an environmental catastrophe, oddly enough, because their federal subsidies were temporarily gone. 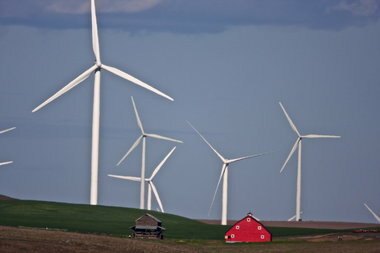 Windmills exist not to profit by selling electricity but by reaping federal tax credits. No power, no tax credit. By some accounts, the "curtailment" cost millions. They demanded BPA reimburse them. BPA declined, rightly, saying ratepayers should not be financially responsible for power not made or used. The American Wind Energy Association accused BPA of promoting "its own narrow economic interests." Salmon advocates were appalled, ironically, favoring windmills over dams even as fish were saved. Litigation is expected, of course. The complaint over lost subsidies for a federally favored industry belies the fact that BPA had no choice. It is constrained by nature, physics and courts. Federal and state policies promoted the construction of more windmills than the electrical grid can handle at critical moments. Local ratepayers should not be penalized for that. No paper policy can keep snow from melting. No planning can instantly produce new transmission lines to cart away power no one needs. A desire for windmills to profit from tax credits should not override the need to protect salmon. And if windmills must be shut down, lost federal tax credits should not be added to our power bills. We might add, and they should not forget, that every kilowatt in the Northwest grid in these days of surplus is carbon free and as renewable as renewable can be. Overgeneration Announcement related to graphic. To safeguard salmon and steelhead and assure reliable energy delivery during these unusually high seasonal river flows, BPA has taken the following measures, which it took as a last resort and had been working to avoid. BPA will update this site at 9 a.m. and 3 p.m., Monday through Friday. [May 20, 9 a.m.] BPA temporarily limited the energy output of regional generators, including wind generators, from 11 p.m. May 19 until 5 a.m. May 20. During that six hour period, approximately 600 to 1,200 megawatts per hour of wind generation, totaling about 5,300 megawatt hours, were impacted. 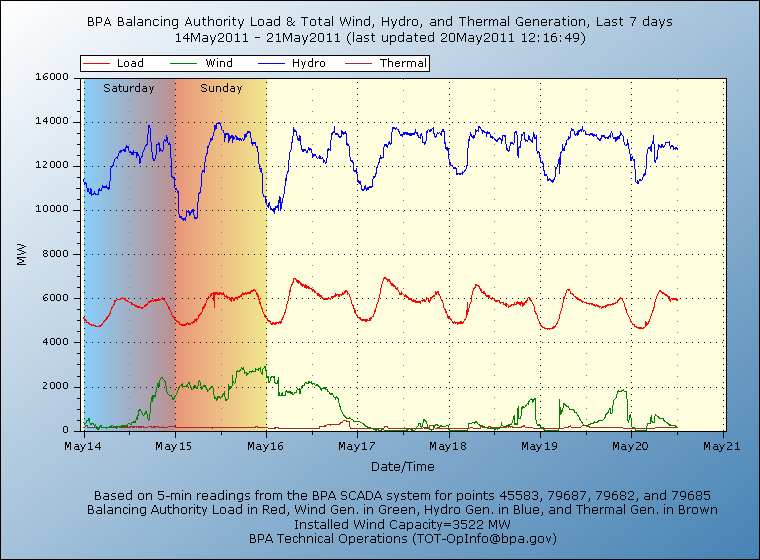 [May 19, 9 a.m.] BPA temporarily limited the energy output of regional generators, including wind generators, from 11 p.m. May 18 until 5 a.m. May 19. During that six hour period, slightly less than 1,000 megawatts per hour of wind generation, totaling about 5,700 megawatt hours, were impacted. [May 18, 9 a.m.] BPA temporarily limited the energy output of regional generators, including wind generators, from midnight until 5 a.m. May 18. Approximately 200-350 megawatts of wind generation per hour, totaling about 1,400 megawatt hours, were impacted. : Editor and Publisher Rufus Woods, Managing Editor Cal FitzSimmons, Chief Financial Officer Janine Bakken and Editorial Page Editor Tracy Warner.